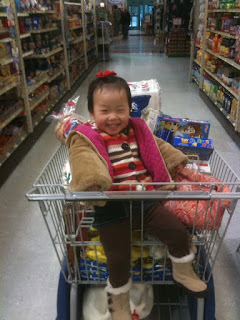 One hour into a grocery expedition and she’s as smiley as ever. See why I’m so smitten? That, and she’s cute as a bug. with ALL of you kids!! I can see why you're head over heels for this girl! so sweet! love her boots too! She IS cute as can be!! Look at those boots!! And…I am movin' up to you guys!! Look at all that aisle room in your grocery store!! And nobody else in the aisle?!?! Gosh…you wouldn't BELIEVE how small the stores are here in Manhattan!! And crowded!! She's a Mama's dream… a smile that big an hour in! You are blessed. No mystery why the love bug has bitten again at your house. What a punkin'! Her smile is absolutely CHARMING! What a precious little girl!! It must be fun to shop with someone that can keep you smiling. Love a girl who shops with a smile!! Hoping your winter storm and generator days are over. Keep warm and Happy! Oh YES SHE IS just OOOO SO CUTE!!!! oh many, what a sweetie! Cute for sure!!!!! What a sweetie! She is such a cuteness!!!! Truly, she is as cute as a bugs ear! LOVE the boots…..and the smile!